Life in the Clouds: Reduce, reuse, recycle! 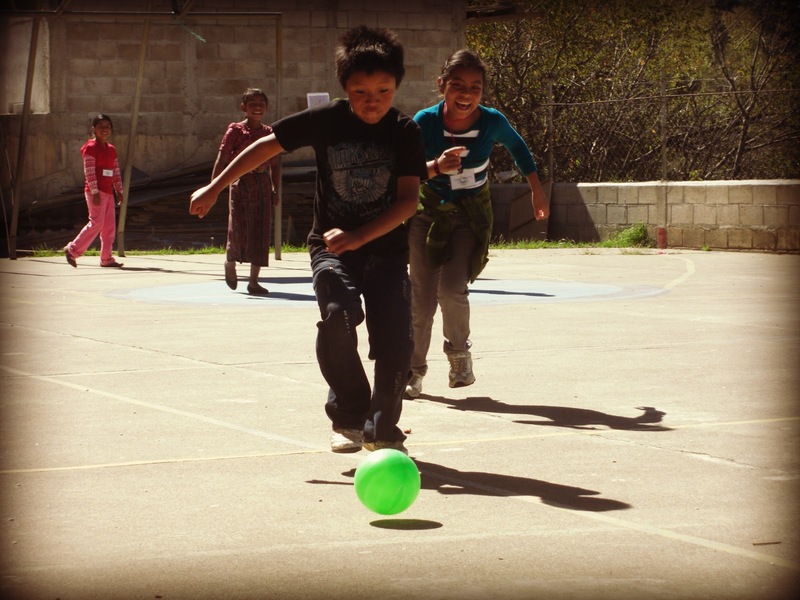 After a rejuvenating retreat to Monterrico and a few days off to recharge our energy, this week we dove back into work as we began the first week of our summer camp with primary school students in Chaquijyá Central. This year we decided to have an environmentally themed camp, which fits well with the bottle school project, and is always an important issue. We divided camp into activities by art, sports, English and environmental education. I am in charge of environmental education, and have enjoyed learning about different environmental issues as I have researched what to teach the kids. First we discussed the importance of water, and the difference between salt water and fresh water. As a group we looked at the world map so the students could visualize the amount of water on planet earth and how much of it is salt water versus fresh water. Did you know that 97% of the water in the world is salt water? And of the 3% of fresh water, only 1% of it is available for humans to use because the other 2% is glacial water! Students were able to reflect upon their personal use of water, and make pledges through illustrations of ways they plan to protect water in the future. Many said that they would pick-up trash from rivers, reduce the amount of water they use for washing their hands, washing dishes or bathing. One student surprised me by drawing a picture of a man in a canoe as the correct way to live, next to a giant ship polluting the ocean. The drawing of the man in the canoe exemplifies the way of the life for so many indigenous populations before being colonized. Yesterday we learned about the top ten most endangered species in the world, and today we had a guest visitor, a friend of mine who volunteered to help with a special activity. 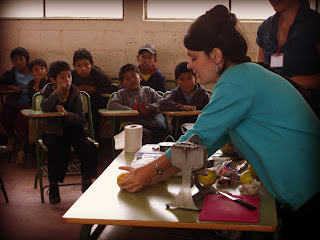 We made juice with oranges for students to drink, and then we used the peels adorned with cloves as homemade/natural citronella candle holders. After they were done with the cups used to drink the juice, we showed them how to make a lampshade by connecting all the cups by paper clips. Both of these crafts are great ways to reuse trash and are very simple if you want to give them a shot! Here is a link with a picture of what the candle holders look like (http://pinterest.com/pin/121104677450925522/). 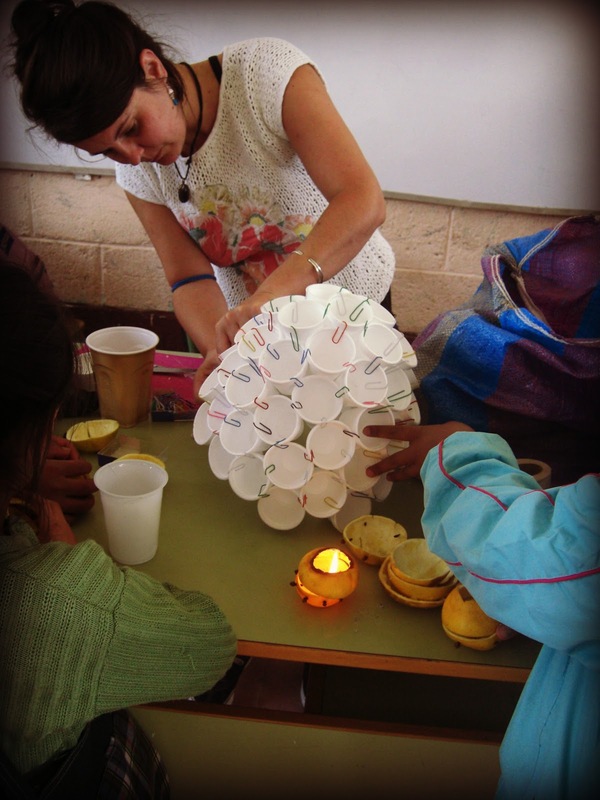 We hope that showing kids how to creatively reuse items will inspire them to seek out new ways of recycling. Every student at the school has been actively involved in collecting plastic bottles and inorganic trash for the bottle school project, and their understanding of the importance of reducing and reusing trash is apparent in the way they talk about the project. Camp has been so successful in part due to the volunteers who have offered to help out. So far we have worked with six volunteers in just one week. Three volunteers have come from Central’s community, which is a huge step forward for us in working side by side with locals. It is inspiring to see people stepping up and offering their time and energy to serve young people in the community. I look forward to seeing more volunteers and ideas for new projects emerge as camp continues. One week down, and three to go!